Can a true disciple of Christ later commit apostasy? Will those who commit apostasy perish? Can someone who was at one time placed in Christ be removed? How one answers these questions depends on how they view eternal security (outline of views). While most proponents of Arminianism hold to a view that a true believer can commit apostasy and thus forfeit salvation, the Arminian camp allows proponents to hold different views on eternal security. Despite holding these different views, it must be understood, Classical Arminianism does affirm that a true believer will possess enduring faith. There is no such thing, Ashby will write, in his essay in “Four Views on Eternal Security”, as a “saved unbeliever”. It is not possible for a true believer to apostate and thus they cannot forfeit salvation. It is possible for a true believer to apostate and thus forfeit salvation. The implication of the first is that any person that has professed faith and later apostates would not be considered as having ever truly been saved (view #2). I subjoin, that there is a vast difference between the enunciation of these two sentences. (1.) “It is possible for believers to decline from the FAITH ;” and (2.) “It is possible for believers to decline from SALVATION.” For the latter, when rigidly and accurately examined, can scarcely be admitted; it being impossible for believers, as long as they remain believers, to decline from salvation. Because, were this possible, that power of God would be conquered which he has determined to employ in saving believers. This article affirms that those who hold to a true faith are assisted by Christ insuring that they have enduring faith and do not fall. However, the possibility of a believer resisting the grace that enables perseverance is left open. But whether they are capable, through negligence, of forsaking again the first beginnings of their life in Christ (Heb 3:6, 14; 2 Pet 1:10; Jude 3; 1 Tim 1:19; Heb 11:13), of again returning to this present evil world, of turning away from the holy doctrine which was delivered to them, of losing a good conscience, of becoming void of grace, that must be more particularly determined out of the Holy Scripture, before we ourselves can teach it with full persuasion of our minds. John Wesley firmly held that “a saint may fall away”. Whether one agrees with Wesley’s conclusions on eternal security, we should draw our assurance in the same place that he does. In his treatise Serious Thoughts on the Perseverance of the Saints (pdf), he wrote that his assurance (ie comfort) was based not on whether he could or could not fall away but rather on an enduring faith. For Wesley, the focus on eternal security based on a past decision was misplaced. Rather than look backwards, people should ask: what do I believe right now. As we wrestle with various passages in the Scriptures I also draw comfort and am confident in this. All believers, as long as they remain believers, are eternally secure in the promises of God. God has promised to grant eternal life to all who believe and hold fast that belief to the end. 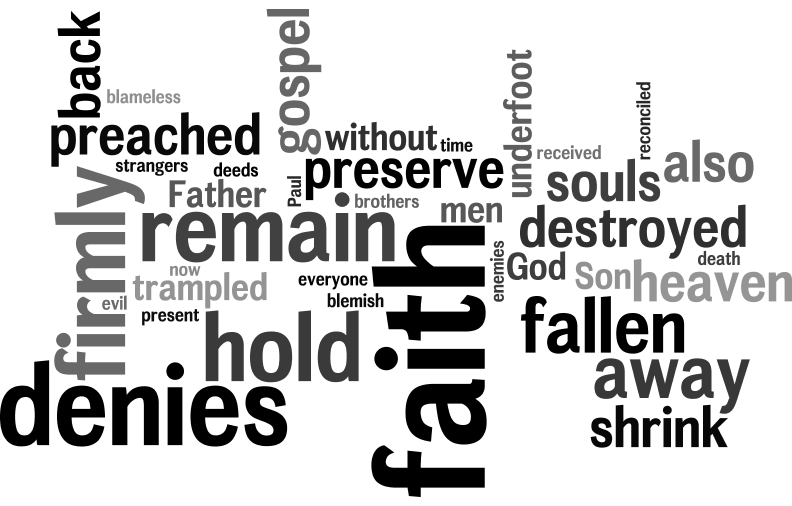 All who leave this world in unbelief, regardless of what they may have professed in the past, will perish. This entry was posted in Theology and tagged Arminianism, Arminius, assurance, eternal security, faith, Grace, John Wesley, perseverance, Remonstrance by MikeB (@AnAgileJedi). Bookmark the permalink.